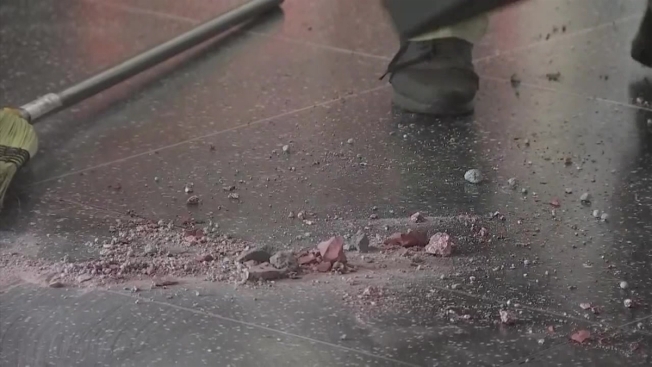 President Donald Trump's star on the Hollywood Walk of Fame was destroyed Wednesday morning by a man with a pickax that witnesses say he concealed in a guitar case, police said. Officers were called around 3:30 a.m. to the star's location on Hollywood Boulevard near Highland Avenue, where they found a small pile of rubble in place of the star that Trump received in January 2007 for his role in the NBC show "The Apprentice." The star-smashing suspect, who reported the crime to police, later turned himself in to Beverly Hills police after leaving the pickax at the scene, according to the Los Angeles Police Department. He called police and said, "See you soon," Lt. Karen Leong of the LAPD's Hollywood Division told the Los Angeles Times. The suspect was identified as Austin Clay, 24, who was booked on suspicion of felony vandalism. His hometown was not immediately available. Bond was set at $20,000, according to jail records. An initial court date was not indicated in jail records and it was not immediately clear whether he has an attorney. Witness David Palmer said he is accustomed to seeing the unusual on Hollywood Boulevard, where tourists mingle with street performers dressed as superheroes and other characters, but he was surprised to see the Walk of Fame vandalism. "I'm like, 'Why are you hitting that star? What did Donald Trump do to you?'" Palmer told NBC4. "Then he went around the corner and I think he left." Workers were sweeping up the shattered remains of the star early Wednesday. As daylight arrived, Walk of Fame visitors stopped to take pictures of the smashed star and have a closer look. One man placed an exercise pullup-bar on top of the crumbled remains, pieces of which some visitors kept as souvenirs. "We came here a few days ago and there was some grafitti on it," said tourist Josh Kallen. "We didn't think anything like this would happen." The Walk of Fame is administered by the Hollywood Chamber of Commerce, which issued a statement later Wednesday morning. "The Hollywood Walk of Fame is an institution celebrating the positive contributions of the inductees," said Leron Gubler, President-CEO of the Hollywood Chamber of Commerce. "When people are unhappy with one of our honorees, we would hope that they would project their anger in more positive ways than to vandalize a California State landmark. Our democracy is based on respect for the law. People can make a difference by voting and not destroying public property." Many visitors echoed that sentiment. "I just think it's wrong," said visitor Greg Donovan, dressed in a red blazer and top hat, and carrying a "Trump 2020" sign. "If they don't like the president, they can show it in a different way." Gubler said there appears to be security camera video of the vandalism. Repairs are expected to begin immediately, but usually requires several days. During past Walk of Fame vandalism cases, stars have been covered to protect them during the work. This is at least the second time Trump's star has been vandalized in the last two years. In October 2016, a man dressed as a construction worker smashed the star with a pickax and sledgehammer. James Otis pleaded no contest to felony vandalism in February 2017 and was sentenced to three years probation, 20 days of community service and agreed to pay $4,400 for the damage. 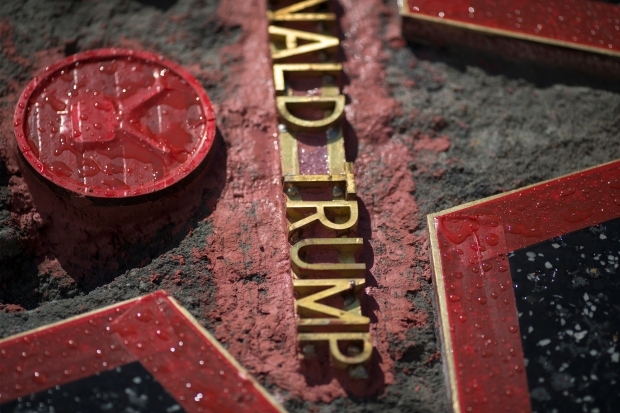 Also in 2016, the star was defaced by spray paint and even surrounded by an artist's 6-inch high wall, a miniature representation of then-candidate Trump's border wall proposal. Walk of Fame star recipients are selected by a committee that considers hundreds of applications each year. The stars are purchased for $30,000, rather than gifted.